Announcement I offer Custom and one of a kind Rosaries--each Rosary is handmade, both unbreakably wire wrapped or cabled(strung). 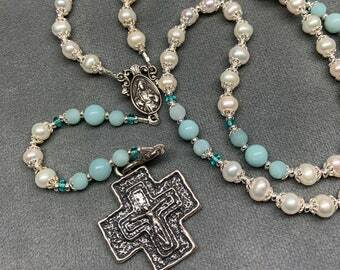 In a wire wrapped Rosary, each bead is wire-wrapped in a swirl of Sterling or Bronze for beauty and durability--these Rosaries will last through a lifetime of prayer! 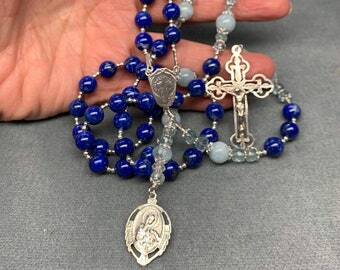 Wire-wrapping is an expensive and time-consuming method for Rosary construction, and not seen commercially--but you will not find a better or more durable Rosary. Cabled Rosaries are very popular also. They are silky smooth and a pleasure to pray. While they are not unbreakable, they are sturdily made and heirloom quality. Each Rosary comes beautifully boxed and gift-bagged, ready for the ultimate gift for someone you love--or a special gift for yourself! 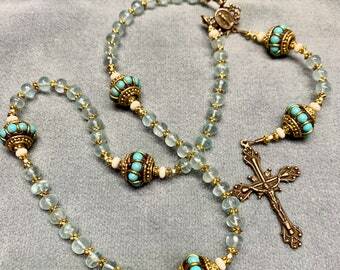 I offer Custom and one of a kind Rosaries--each Rosary is handmade, both unbreakably wire wrapped or cabled(strung). 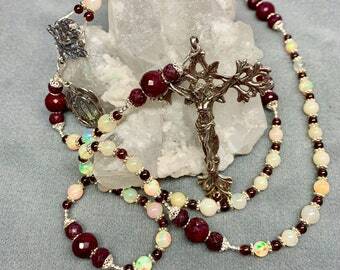 In a wire wrapped Rosary, each bead is wire-wrapped in a swirl of Sterling or Bronze for beauty and durability--these Rosaries will last through a lifetime of prayer! Wire-wrapping is an expensive and time-consuming method for Rosary construction, and not seen commercially--but you will not find a better or more durable Rosary. 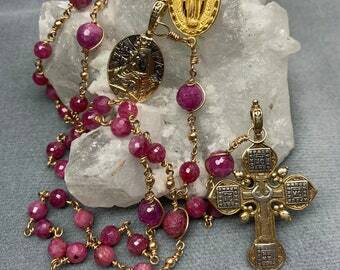 Welcome--My goal at HeartFelt Rosaries is to offer you heirloom, handcrafted Rosaries that pray well and will last a lifetime. You may have seen my Rosaries on other sites, but you will find my finest work here.